How would you like to rule the world? Harry Secombe sang a song If I Ruled the World, which painted a rosy picture of peace and happiness. But how would you enforce it? How would you deal with those who didn’t want to be ruled by you? 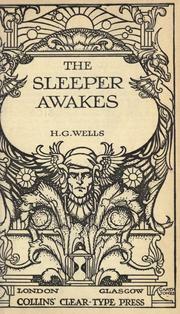 H G Wells wrote a story about just such a problem, When the Sleeper Wakes, that was serialised between 1898 and 1899. It was rewritten as a novel, The Sleeper Awakes in1910. His view of the future is decidedly dystopian. Graham, an Englishman living in London in 1897, takes drugs to cure insomnia and falls into a coma. He wakes up in 2100. He later learns that he has inherited huge wealth and that his money has been put into a trust. Over the years, the trustees, the ‘White Council’, have used his wealth to establish a vast political and economic world order. When he wakes Graham is disoriented. The people around him had not expected him to wake up, and are alarmed. Word spreads that the ‘Sleeper’ has awakened. A mob gathers around the building and demands to see the fabled Sleeper. The people around Graham will not answer his questions. They place Graham under house arrest. Graham learns that he is the legal owner and master of most of the world. The White Council invested his wealth to buy the industries and political entities of half the world, establishing a plutocracy and sweeping away parliament and the monarchy. The Sleeper is just a figurehead. Graham meets Ostrog, who leads a rebellion against the White Council. The rebellion succeeds and Graham becomes the ruler of the world, except Ostrog holds the real power. As Graham learns about the world he sees that the lower classes are still dominated and exploited. No one lives in the country or small towns any more, all agriculture being run like industry; and there are now only four huge cities in Britain, all powered by huge wind-mills. Lives are dominated by ‘babble machines’ which spread news and ‘pleasure cities’ where unspecified joys are available. ‘Euthanasy’ is considered normal. Graham learns that Ostrog has ordered his troops to London. Graham confronts Ostrog, who tries to arrest Graham. The workers rise up again and help Graham to escape. He leads the liberation of London. Ostrog escapes and joins his troops who are flying to London. His men still hold a few airports. The revolutionaries have only one aircraft; Graham gives away all of his wealth to the rebels and proceeds to fly their only aircraft against the invaders, bringing some of them down. Graham attacks Ostrog's aeroplane but fails. Graham's aeroplane crashes. It must have been a hard book to read, since the outlook is totally bleak and the protagonist dies at the end. So do you still want to rule the world?